In an Industry that produces many new artistes, Cyborg is quickly hitting the dancehall reggae scene with inspiring lyrics and fierce rhythms. Haling from his hometown in Georgetown, Guyana, Cyborg has hit the reggae scene in his present home in Toronto, Canada with such intensity that it has left the industry chanting and buzzing. Born under the name,Keith Sandiford he gained the name Cyborg because of his skill to quickly create lyrics on the spot, no pre-written lyrics, but pure dexterity to churn out songs like a scientific robot. Cyborg is currently putting together a compilation of his songs and music videos in which he plans to release soon. He is also promoting his music by performing at stage shows and other events held all over Canada. Cyborgs career took off in 1994 in his hometown where he started appearing at school fetes where he would perform songs by his favourite reggae artist Buju Banton, Bounty Killa or Beenie Man. Upon arrival in Toronto in 1998, Cyborg brought his talents and skills to the people by djing with a sound system called Baseline and fellow artist Elemental one. It was then that Cyborg decided to start composing his own lyrics and started recording with Explorer recording label. In 2001, his songs Plan to Make Millions and Woman me ah Feature started to hit the radio waves which lead into performing at stage shows along side some of dancehalls greatest such as Barrington Levy, Lucky D, Singing Melody, Brigadier Jerry, Everton Blender, Ward 21, Delly Ranks, Tok Ce Cile. His other performance was along side Sizzla in Montreal , 2004. You would have also had a chance to spot Cyborg at the Toronto Reggae Festival that was also held in Montreal in the summer of 2004 performing with artist Shaggy, Wayne Wonder Spragga Benz and many other local artists. Cyborgs musical talents were inspired by singers such as Bob Marley, Sizzla, beenie man, Bounty Killa and Buju Banton. 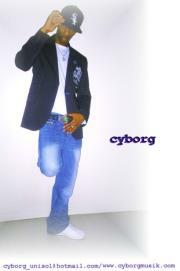 Cyborg has also created a music video for hit single Woman me ah Feature which has been aired on TV stations in Guyana. Hes hoping to be debuted on BET and Much Music. But like predicted by many in the industry, Cyborg hasnt shown what he can fully deliver. He is enjoying the vibes from peers and fans who have gotten a taste of what he can deliver. Hes getting ready to hit the reggae dancehall industry with a bang, so watch out for him.